Communication sophomore Jun Sung Ahn publishes violin covers of pop songs on YouTube. In 16 months, he’s had 17 million views and 130,000 subscribers. YouTube’s “recommendations” feature an endless list of covers of top 40 songs sung by people all over the world but with hardly any differentiation amongst them. Through the recent surge of “Glee” and an a capella culture, this trend has become even more prevalent. Every week, a new star is born via a popular cover, but the fame dies as quickly as it is incited, as he or she is replaced by the next mainstream YouTuber. With such a tedious weekly cycle, it is hard to keep up with each week’s fashionable videos. Frankly, it’s easy to lose interest in these covers. Communication sophomore Jun Sung Ahn, who makes videos on YouTube under the pseudonym Jun Curry Ahn (a play on his ethnicity), offers a new take on YouTube’s music scene. Since July 2011, Ahn has recorded and published violin covers of popular songs on the website. In just 16 months, he’s had 17 million views and 130,000 subscribers. His cover of Psy’s hit “Gangnam Style” reached more than 2.4 million views. Ahn started playing classical violin in fifth grade. Since then, he has performed in countless competitions and recitals. 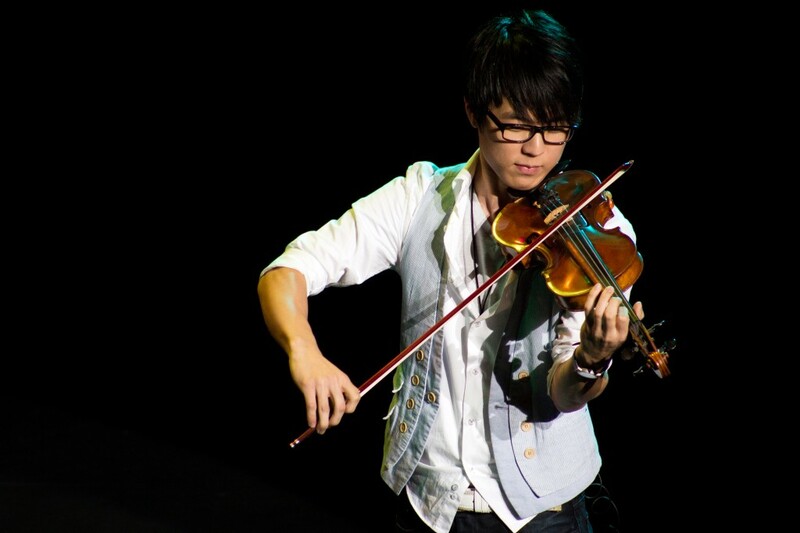 Unlike many of his friends from high school, Ahn wanted to continue his violin career in college. Even though he’s not a Bienen music major, he’s heavily involved in performing on campus. When he entered Northwestern, he immediately joined the full-size orchestra, Philharmonia. He is also involved with NU’s Asian-concentrated dance crew, Refresh. One might wonder why a student so devoted to classical performance would decide to venture into making pop covers. However, like so many successful YouTubers, Ahn created his channel out of boredom. Ahn’s success did not happen overnight, but in comparison to the numerous YouTube channels that often go unrecognized, it didn’t take him long to attract the attention he’s received. View count and comments started to increase as Ahn began making more videos. Although his YouTube fame is relatively new, Ahn isn’t new to making covers. Throughout his years of studying the violin, Ahn would wind down after long hours of practice by playing his own renditions of pop songs. The musician is clearly passionate about music of all genres, as evidenced by an eye-catching Taylor Swift poster that hangs on his wall in his videos. Certainly, viewers from all over the world have come to love his videos, so much so that he receives regular mail and gifts in a P.O. box at home in New Jersey. Among his favorites is a handwritten letter which includes illustrations of him in his videos. Internet fame comes with a price, however. Making regular YouTube videos is a time-consuming activity, which has taken a toll on other aspects of Ahn’s life. He dropped out of Philharmonia due to the lack of time he was able to commit to it. This may be due to the amount of attention he devotes to each cover. In one particular video, Ahn collaborated with his friends at Refresh to create a vocal, dance and violin cover of BigBang’s K-pop smash, “Blue.” Refresh president Jasmine Hubbard recalls her experience of working with him on the cover. Communication sophomore Kevin Kim, who regularly helps Ahn with his videos, agrees. The amount of effort put into creating a high-quality video cover does not go unnoticed by fans or by his fellow NU students. Another thing Ahn lamented about being a YouTube star is the fact that incoming freshmen already know about him before a formal introduction. Nonetheless, Ahn is appreciative of the success he has achieved in the past year and half. Undoubtedly, the money he makes through YouTube surpasses any work-study job he could have gotten at NU. He is also grateful for the encouragement of his large fanbase and the opportunities his videos have opened up for him. Being a YouTube star has allowed Ahn to perform in many shows. He has collaborated with other successful YouTube artists such as Arden Cho and Sungha Jung, and he also recently traveled to Los Angeles for the final round of the Asian arts and entertainment competition, Kollaboration Star 2012. He first competed in Chicago during the summer, appearing on a television show where they picked the contenders for the finale in Los Angeles. Although his achievements surpass those of a typical college sophomore, both Hubbard and Kim said Ahn reflects the talent that can be found all around campus. Ahn agrees and would like to see more of his peers showcase their skills online.